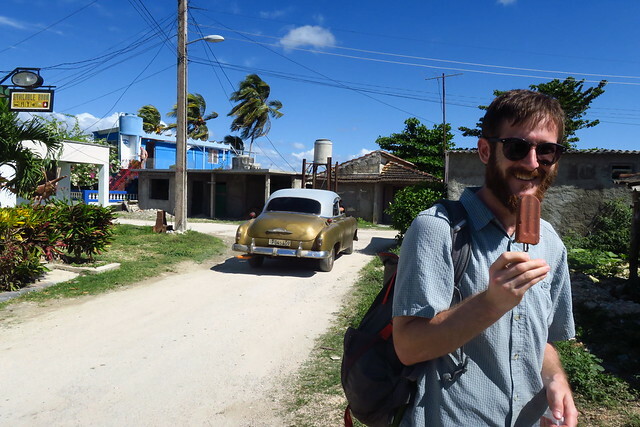 In our last post, Nick commented that Cuba didn't feel homogeneous like the US can feel, where almost everywhere you go, you'll find the same stores, fast-food restaurants, hotels chains, etc. At the same time, one could argue that Cuba, while refreshingly void of Starbucks and McDonald's, is even more homogeneous than the US in that the government owns and controls everything, all the 'official' government stores have the same products at the same prices, and all its citizens are granted the same rationed and subsidized set of food and household products. 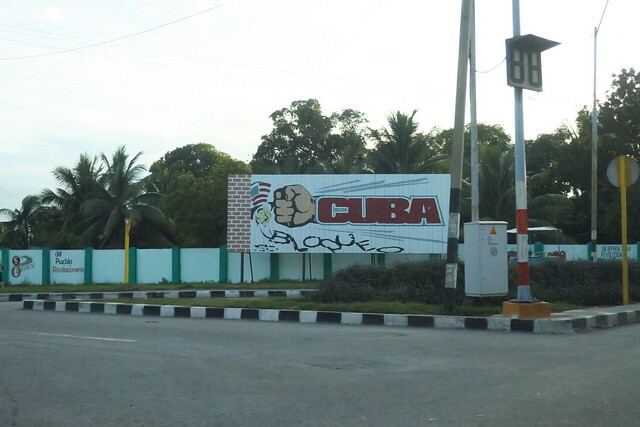 If there's one thing we could safely conclude about Cuba after our short time there, it's that contradictions abound. 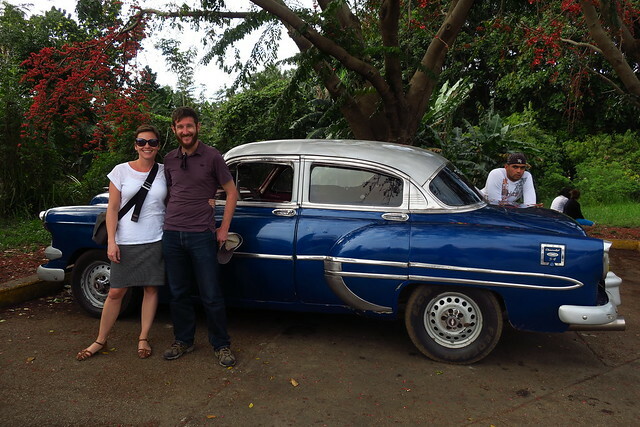 Cuba was edgy, romantic, and incredibly confusing to us as first time visitors. 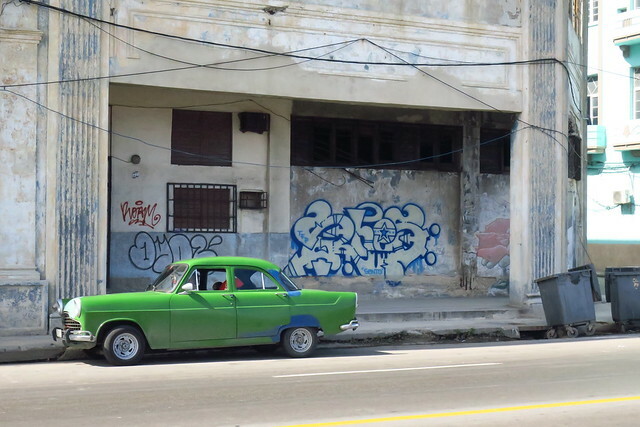 However, upon reflection, the things we foreigners find nostalgic, photogenic, and beautiful about Cuba--crumbling buildings in faded and chipping Easter egg hues and 1950s Chevrolets in bright reds, blues, and pinks--are dwellings that are unsafe for living and vehicles that need constant upkeep for Cubans. Not to say they aren't proud of their immaculate magenta '55 Bel Airs, but when it comes down to it, there isn't much of a choice in the matter. 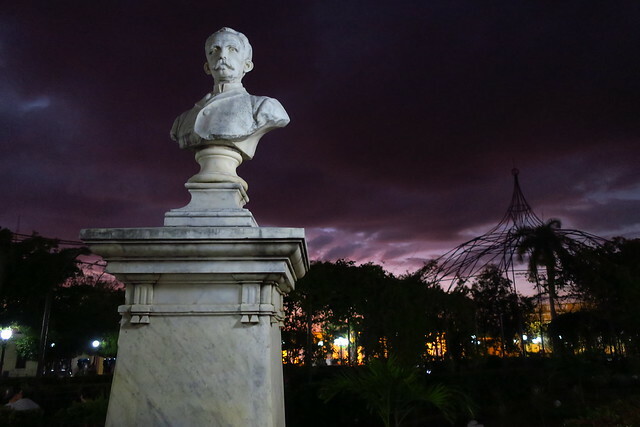 The intermittent black outs may provide a romantic star-gazing break in the evening for a visitor, but these things are all part of the tough reality that Cubans have to make the best of. The government provides everything, but yet in some respects nothing, at least not enough to do much more than barely scrape by. We were amazed by how many buildings, forms of transportation, appliances, shoes, etc. had clearly been rehabilitated more than a few times. Cubans have to be some of the handiest people, with all the things they've had to repair and keep running over the years. Another gentleman we met explained to us enthusiastically the system the government uses to provide each person with a set amount of food, household and personal care products per month at subsidized prices. 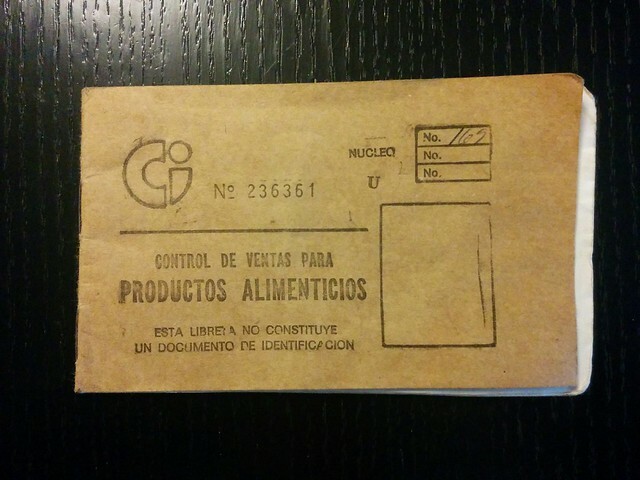 He even gave us an old ration book so we could see how the system works. But when we asked whether it was enough to live, his enthusiasm turned into a more somber reply: "Yes... Well, mostly. We have to buy the rest on the black market." We heard from others that the rations are perhaps enough for about 10 days of the month. The rest is gathered from here and there; some food and gas you can buy on the black market; perhaps other items you trade for; sometimes, you rely on a relative or neighbor. And what you can get your hands on, you will wait for. Cubans are famous for being very patient while waiting in line. They have a whole system that makes it somewhat more bearable (and somewhat maddening for us...), whereby they go up, ask who is last in line, and establish themselves as behind that person. Then they can walk away, hang out across the street in the nearest shade, or go talk to a friend around the corner, which must make the long wait less painful. However, it also means that when you go up to a bank, or a store, or a bus line, you don't really know how many people are actually in front of you, since half of them are physically somewhere else. We found that out the hard way, when we waited to exchange money for over an hour outside a bank that looked like it only had 5-10 people in line, but others kept coming out of the woodwork to claim their rightful spot each time the security guard opened the door! There are so many aspects of this system that we didn't discover and couldn't understand in our short time there. Take money, for example. Cubans are paid in pesos, but items are sold in government stores for Convertible Pesos (CUCs), which is the currency for which foreigners exchange their money. One CUC = 1 USD (but if you're exchanging USD for CUCs, you'll really only get .87 CUC because of the 13% in fees they levy). Restaurants sometimes list prices in both currencies, and sometimes they are the same value, other times the tourist price is 20-30 times higher. 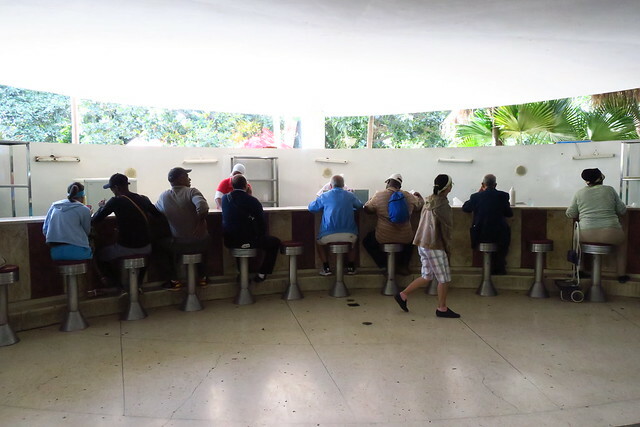 For example, one of our must-visit sites was Coppelia, which I can't describe as anything other than a Soviet-style ice cream park (don't get me wrong, the place is amazing). 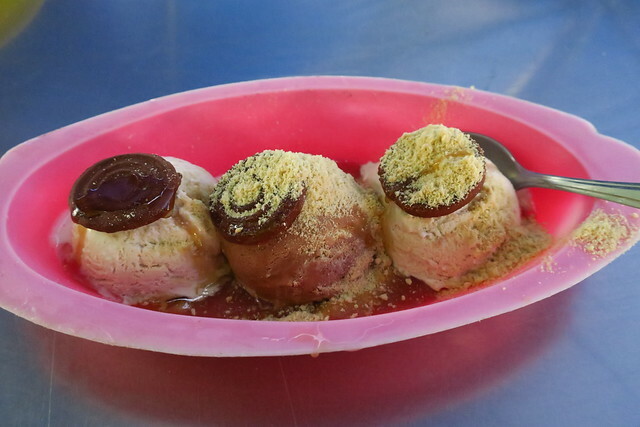 If you have pesos, a scoop of ice cream costs 1 Peso (which is about $.04). 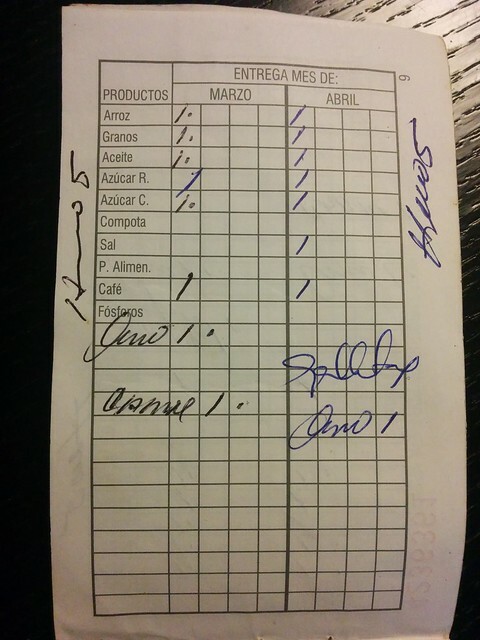 But if you buy the same scoop of ice cream in the CUC-paying section, you'll pay 1 CUC, which is about $1. There is nothing stopping a foreigner from buying his ice cream with Pesos and enjoying the company of the locals while he's at it. Coppelia - It's an Ice Cream Park! Made famous by the Cuban movie Fresa y Chocolate (Strawberry and Chocolate), Coppelia is a social and cultural center of Habanero society. Every day, locals flock to the ice cream parlor which takes up an entire city block and is divided into about four sections. The popularity of the various sections shifts over the course of the day as the sections and their associated areas of waiting in line (of course, see above) pass in and out of shade. Once inside, the customers belly up a spot at the curved bars, or gather their family around their favorite table under one of the slender, curved arms of the spider-like concrete structure. We even watched one man order a two-gallon tub presumably to bring back to his family, but while he was waiting he couldn't pass up the opportunity to throw back about five scoops. Cubans are passionate about their ice cream, so it's no wonder the menu seemed complicated and inscrutable, about ten items long even though your only choices appeared to be how many scoops you want of which of the two flavors on offer. We felt a slightly-less-than-warm welcome in the local currency section, so we didn't feel comfortable asking for a full explanation. Since we left the visit for our last day in Habana and were essentially having it for breakfast, I opted for just one scoop (to the consternation of our waiter), and Nick went with three. All dishes appear to come with cookie crumbs, chocolate disks, and a delicious honey-caramel sauce. 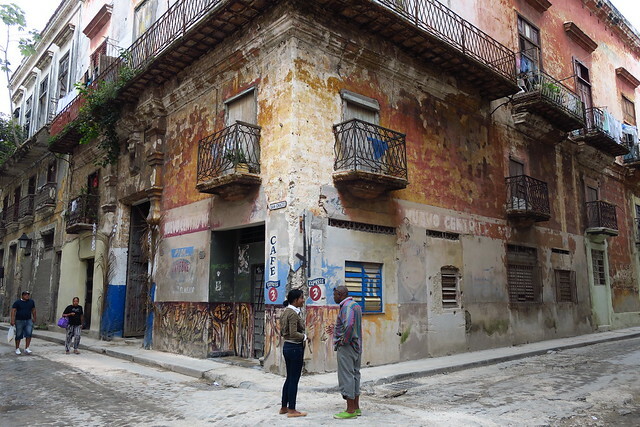 Like many visitors before us, we were left with more questions about Cuba than answers. In a society where crimes can be severely punished, how is everyone illegally buying and selling stuff all the time, and no one seems to be getting in trouble for it? If everyone is supposedly provided for, why are so many scraping together odds and ends and breaking laws just to feed themselves? How can everyone be equal when the government doesn't pay its citizens a living wage or provide enough food, reliable electricity, or housing, and foreign money from tourism is the only real way to live a comfortable life? Oh, the irony of wanting to keep American values and businesses out, but creating a system in which US Dollars and Euros actually run the economy. It might be tempting, as Americans, to point to the tragedies of the "special period" in the wake of the collapse of the USSR as evidence that the Revolución is a failure. And it might be tempting to see the recent thawing of relations as a path for the US to help to enrich the Cuban people and improve some of the shortcomings of the Castro regime. But it's precisely this kind of neo-Colonialist attitude that the Revolución was so stridently against. Furthermore, Cuba's social systems are actually stronger than the common American conception may allow for: the country ranks fifth out of 20 Latin American countries on the UN's Human Development Index statistic (and second in the previous year's report). This tension is why it's going to be so interesting to watch the changes in Cuba over the next 5-10 years and further: I forsee a continued conflict between the proud and principled goals of the Revolución (which billboards on all roads proclaim is still alive and progressing) and the corrupting and economically divisive realities of global Capitalism. Of course, Cuba is no stranger to Capitalism; it's been steadily loosening controls on the free market to make ends meet after the collapse of the USSR, and flocks of Canadian and European tourists pack the streets of Habana Vieja and line the beaches outside government-owned resorts. But with the recent and rapid movements toward direct flights from the US, the tourist demographic is about to shift dramatically, and the scale of the entire tourism industry is about to explode. All of which is to wholeheartedly suggest you visit this fascinating country, but consider the effects of your actions, your dollars, and your presence there. 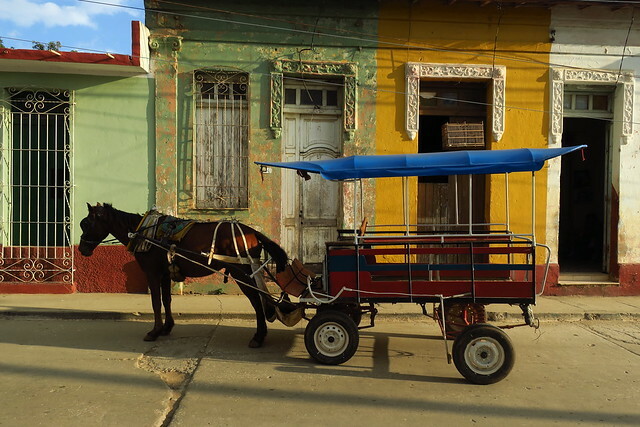 The types of decisions you make about where to stay, where to eat, and what to do have a tremendous bearing on the future of the country, so we can only humbly suggest that you consider your effect when traveling (the same suggestion applies everywhere, of course, but doubly so for Cuba in this time of tremendous changes).